The Max Energy 2.0 Power Programmer delivers more power-per-dollar than any other bolt-on on the market today. Plus, it installs in less than 15 minutes without using tools or getting your hands dirty. Hypertech's award-winning Power Tuning adds maximum horsepower, torque, and performance for any kind of driving for vehicles using regular, premium, E85, as well as diesel fuel. The Max Energy 2.0 also has a larger backlit LCD screen for quick and easy setup and user-friendly navigation for simple installation, tuning, and feature options. The 30-day money back guarantee applies to the Max Energy Power Programmer, E-CON Economy Power Programmer, and the Speedometer Calibrator. The product MUST be returned to place of purchase within 30 days. All items must be received in a new, unused and ready-to-sell condition (including all original packaging, parts, and paperwork) to receive a refund, excluding any shipping and handling fees. In the interest of improved air quality, the California Air Resources Board (CARB) requires new vehicle and manufacturers of aftermarket parts to develop engine and emissions equipment that either reduce or maintain specific air pollutants affected by vehicle use. Both the California Vehicle Code (Section 27156) and Federal Clear Air Act (administered by the Environmental Protection Agency) prohibit modifications that increase vehicle emissions. Hypertech includes meeting all E.O. requirements in its product development process. This guarantees that users of Hypertech Power Tuning products will meet certification requirements when registering, selling or needing to pass various emissions tests or Inspection and Maintenance (I&M) programs administered by state or local enforcement agencies. So, on an ongoing basis, Hypertech obtains and includes CARB E.O.s for its emissions-related products. This ensures these products are not detrimental to ambient air quality and meet requirements necessary for their legal sale and use. Make sure that any emissions-related product you buy and install carries an E.O. number. Without this verification you are at risk, in potential violation of regulations and may incur unnecessary financial obligations during vehicle inspection. Hypertech’s Power Tuning is the only tuning on the market that allows you to use the highest power level for towing while maintaining safe EGTs. This means no worries about damaging your engine or transmission when towing up to the maximum weight rating specified by the vehicle’s manufacturer. Hypertech develops and tests all Power Tuning under real-world conditions using maximum load and steep grades to ensure dependability. Cold air intakes change the air velocity and the volume of air passing over the Mass Air Flow (MAF) sensor due to the shape and size of the ducting around the MAF sensor and even the type of air filter used. Retuning the engine calibration for specific popular cold air intakes that are installed is necessary to correct the MAF readings and to take advantage of the increased airflow. Hypertech offers an emissions certified version of the Max Energy 2.0 that is legal in all 50 states, including California. Only applications that have been emissions certified for sale in California are available in this version. In addition, there is NO DIFFERENCE IN POWER, PERFORMANCE, OR FEATURE OPTIONS for the same vehicles offered in the non-certified version. 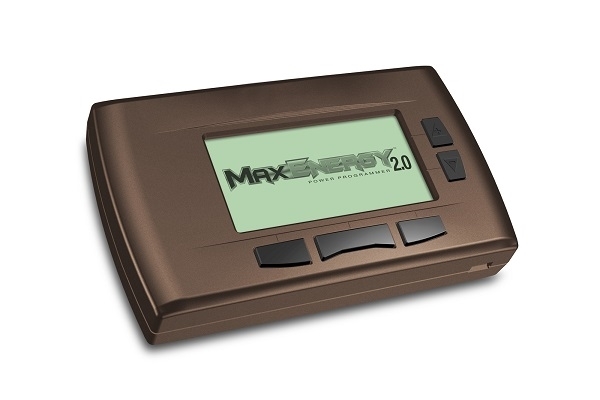 If you’ve installed tires that are larger or smaller than original equipment tires, or if you have installed a ring and pinion gear set with a different rear gear ratio, the Max Energy 2.0 allows you to re-program for correct speedometer and odometer readings, as well as correct part-throttle shifting. The vehicle’s computer calculates your vehicle’s speed based on the diameter of the stock tires. If you’ve installed taller or shorter tires, or changed the rear gear ratio, the vehicle’s computer doesn’t know how fast your vehicle is going. As a result, the automatic transmission may not shift correctly and the speedometer readings will not be accurate (as required by law). Larger than stock tires often times will have a different tire pressure than smaller stock tires. Adjust the TPMS warning threshold when larger than stock tires are installed. Automobile manufacturers limit a vehicle’s top-speed to match the speed rating of the factory-installed tires. If you have installed tires that have a different speed rating, the Max Energy 2.0 allows you to raise or lower the vehicle’s top-speed limiter to match the speed rating of the newly installed tires. A tire’s speed rating for maximum safe speed under perfect conditions is marked on its sidewall. Always obey all traffic laws when driving and only use this feature for off-highway competition in sanctioned events. Increase shift firmness to maximize performance or when towing, to reduce clutch slippage and transmission oil temperatures. That means longer transmission life. However, this feature must not be used If you have installed an aftermarket shift kit. The Max Energy 2.0 allows you to raise or lower the shift points in 100 RPM increments for maximum performance, quicker acceleration, and better 1/4-mile times. With the Max Energy Power Programmer, you have the ability to customize the shift points for every gear. Optimizing each shift point can definitely improve performance. Fuel Management Systems "V4/V8 mode"
For improved fuel economy, vehicle manufacturers have developed V4/V8 modes. Chrysler & Dodge vehicles use the Multi-Displacement System (MDS) and GM has the Active Fuel Management System (AFM). These systems allow the engine to turn into a fuel sipping 4-cylinder during light load conditions such as steady speed cruising. Hypertech perfected the engine efficiency in V4 mode for both regular and premium octane. These systems have major benefits in fuel economy, but with a sacrifice in drivability when in V4 mode, and during the transition to V8 mode. The Max Energy allows you to adjust the minimum speed at which the V4 mode activates. Adjusting the minimum speed higher would prevent the V4 mode from activating while the road noise is low and V4 exhaust note is noticeable. Activating at a higher speed would allow for full benefit of the Max Energy 2.0 engine tuning in V4 and V8 mode at those higher speeds where the exhaust sound isn’t as noticeable. The V4/V8 mode can also be disabled completely as well. The "selectable throttle restriction" tunes the engine control systems for better low speed performance without sacrificing driveability, but it does not disable the torque management completely. There are many different torque management systems active at any given time while driving. During Hypertech's tuning development they altered most of these systems in different combinations to assess the impact on performance, and driveability. Hypertech took the best combination of those changes and combined them with further tuning to improve the overall performance and driveability under all driving conditions. The overall affect was so dramatic Hypertech felt that all customers would benefit more if the changes were user selectable rather than "forced." In today’s vehicles, the onboard computer controls maximum engine rpm. The stock computer is programmed to shut down the engine when it reaches its redline. But if you have modified your vehicle to increase its high-speed performance, more rpm means more power. When you shift gears with the stock rpm limit, the engine falls back to below the peak of its horsepower curve. When you extend the engine’s rpm range with the Max Energy 2.0 Power Programmer, your engine has more power available after gear changes. By adjusting the maximum rpm to keep the engine in the “sweet spot” of its power curve, you can increase the average horsepower that accelerates the vehicle. The Max Energy 2.0 allows you to adjust the “on/off” temperatures of your vehicle’s electric cooling fans to match a lower temperature thermostat, such as a Hypertech PowerStat. A low-temperature thermostat produces a cooler, denser intake charge, is less likely to detonate under heavy loads and allows the engine to make more power. If you get a “check engine” light or “service needed” message, the Max Energy 2.0 will allow you to read the code and gives you the ability to clear the code and turn the “check engine” light off. You can then make the necessary repairs to prevent the light from coming back on. Hypertech’s Max Energy 2.0 downloads and saves the stock tuning program, then uploads your customized Power Tuning program. Before taking your vehicle into a dealership for service, always return the vehicle’s computer back to the factory programming. Once you have the vehicle back from the dealership, reinstall the Max Energy 2.0 Power Programming as before. The Max Energy 2.0 can only be used on one (1) vehicle at a time, so if you sell your vehicle or want to use it on a friend’s vehicle, simply return your vehicle to the stock tuning program and you may then use the programmer on another vehicle that is covered in the same part number. 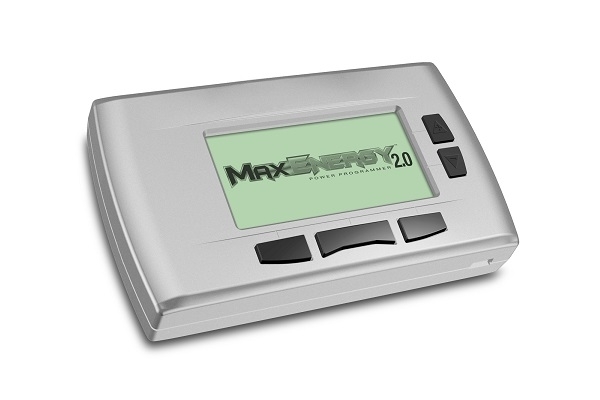 The Max Energy 2.0 Power Programmer comes with a USB cable and a CD containing software to enable quick updates over the internet. If your vehicle has a new calibration not available when your Max Energy 2.0 Power Programmer was manufactured, it is possible that you will see a “Cal not found” message on the Max Energy 2.0 screen. If this occurs, you can simply update your Max Energy 2.0 with the correct new calibration via the internet. Simply connect the Max Energy 2.0 (using the provided USB cord) to your computer and go to www.hypertech.com. Then click on the Support button to get update downloads. You can also get the update downloads using the CD which also contains an installation video and a printable version of the instruction manual.